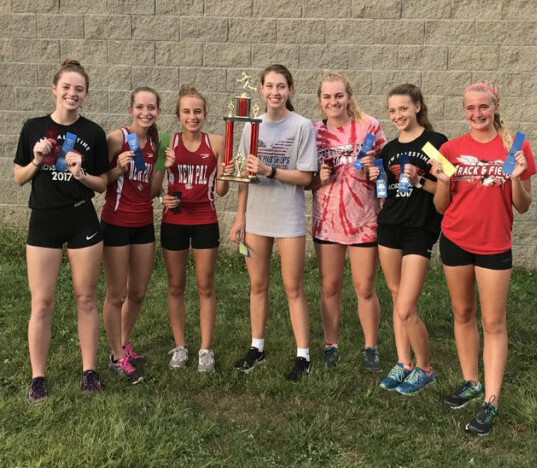 The New Palestine cross country teams swept the Hancock County championship hardware Tuesday, with the Dragons claiming team and individual titles on their home course. 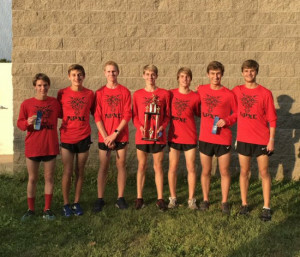 The Dragons won the boys title with a 1-2 finish and a score of 32 places, beating Greenfield-Central (58) by 26 places. Mt. Vernon (61) was third and Eastern Hancock (80) was fourth. The Dragon girls took four of the top five places to tally a score of 22, beating Mt. Vernon (55), Greenfield-Central (73) and Eastern Hancock (89). 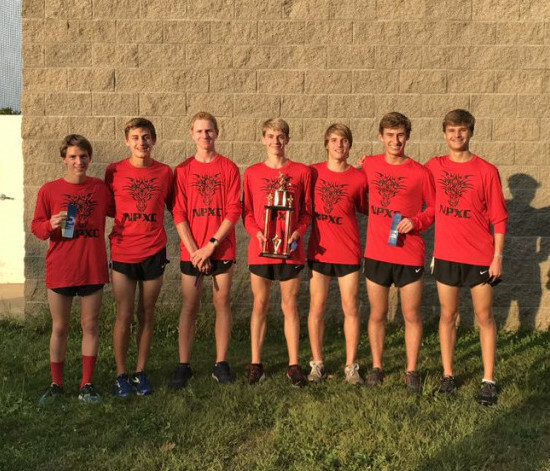 For the boys, Kyler Harrison was the individual champion with a time of 17:17.66 in the 5K race. Drew Austin was second (17:31.69). Devon Whitaker placed eighth (18:16.51). Josh Collins was 10th (18:20.91) and Quinn Dobbins 11th (18:20.91). NP freshman Brenna Shaw (20:48.70) was the individual girls champion, with Kendall Mann (20:59.01) placing second. Grace Voelz was fourth (22:38.71) and Haley Rickey fourth (22:47.94). Sophia Taylor placed 10th (23:37.69), giving the Dragons five runners in the top 10. The Dragons next compete Saturday in the Shelbyville Golden Bear Invitational at the Blue River cross country course. The New Palestine girls team celebrates with the Hancock County championship trophy. The New Palestine boys team celebrates its county title.